After a year of research, hemp CBD oil is now available at Executive Medicine of Texas. Like all of the products that make it into their small and selective Stay Young brand, this product exceeds industry standards. Not all CBD oils are created the same. 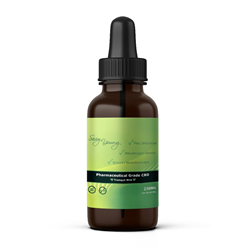 The tincture offered in the Stay Young Brand is a premier product. It's organically grown and full spectrum. Using the most advanced nano technology, the absorption rate and bioavailability far exceed those of other brands. The US based supplier is also Farm Bill compliant. Stay Young brand Hemp CBD is gluten free and contains no harsh chemicals, no metals, and is tested to be 100% THC free. Not all CBD oils on the market can make such a claim. J. Mark Anderson, MD stated, "We were seeing a demand from patients. The products they were using were not guaranteed to contain zero THC and many were not tested as rigorously as we like to see. This sent us on a quest to offer our patients and others a better option." The Stay Young brand pharmaceutical grade Hemp CBD oil comes in two flavors, mint and lemon. Currently, they are offering the product in three strengths: 250mg, 500mg, and 1500mg. Most CBD products are produced from industrial hemp, but the source of the Stay Young brand is derived from a CBD-rich cannabis sativa strain known as PCR hemp. The amount of phytocannabinoid (PCR) causes it contains as much as ten times the concentration of CBD as generic industrial hemp. According to Judy Gaman, CEO of Executive Medicine of Texas, "While research is still ongoing, many people report success with hemp CBD for stabilizing mood, reducing stress, and improving sleep, just to name a few. The list goes on. And for chronic pain, it may be the answer to the dangerous opioid crisis we're facing." CBD oil is not the same as marijuana. The THC that gives a high from marijuana is negligible in CBD oils, and in the Stay Young brand is proven through confirmatory testing to be zero. The Stay Young Brand pharmaceutical grade CBD oil can be ordered online or purchased at Executive Medicine of Texas. Notice: The efficacy of CBD oil products has not been confirmed by FDA-approved research as a treatment for any medical condition. The information in this press release is not intended to diagnose, treat, cure or prevent any disease.